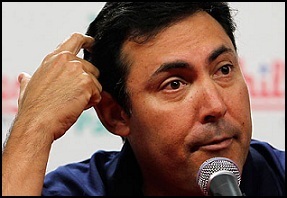 The options are running thin if Ruben Amaro Jr. plans to add a corner outfielder via the free agent market. Cody Ross signed a three-year deal worth $26 million with Arizona last week and less than 24 hours later Nick Swisher signed a four-year deal with Cleveland worth $56 million. Amaro said he's willing to use a double-platoon of Domonic Brown and John Mayberry Jr. in rightfield and Laynce Nix and Darin Ruf in left, but a strategy like that comes with more questions than answers. The current market for outfielders is ridiculously expensive. Putting Ross and Swisher aside, B.J. Upton received a five-year deal for $75.25 million, Angel Pagan received four-years at $40 million and Shane Victorino signed for three-years at $39 million. The only big-name outfielder remaining on the market is Michael Bourn and he's not a fit for the Phillies, especially since the club went out and traded for center fielder Ben Revere earlier this month. With so few options remaining on the free agent market Amaro may look to acquire a corner outfielder via trade, but he's already dealt away the club's top chips in Vance Worley and Trevor May. Justin Upton is an intriguing option and it's clear with the addition of Ross that Arizona is willing to move the 25-year-old, but he's owed $38.5 million over the next three years and Amaro doesn't appear to have the prospects likely needed to swing a deal. Jason Kubel is another option and he would cost significantly less in a trade. The 30-year-old has averaged 22 homers and 84 RBIs over the past five seasons with a .269/.337/.478 slash line. He's a defensive liability but that may not matter as much with the speedy Revere in center covering a large chunk of ground. Alfonso Soriano remains an option, but he's 36 and owed $36 million over the next two seasons and he's an abomination in the outfield. "Would we like to add more power to the lineup? Sure. Again, it’s more about production than power. I think we have guys who can produce, (newly acquired third baseman Michael Young) being one of them obviously," Amaro said. “I think there’s other guys we have — Jimmy (Rollins) as a switch hitter. Depending on how the outfield is constituted, I think we’ll figure it out." The Phillies payroll for 2013 currently sits near $146 million. The club has financial flexibility and sits well under the luxury tax threshold of $178 million, but money can only go so far. Amaro's patience to this point should be applauded, but now he's in a position where he needs to truly be creative to score an outfielder with some power.